The ability to predict macroscopic physical and chemical properties from information derived at the micro-scale or atomic scale for various kinds of materials has yet to be perfected in the field of materials physics and chemistry. Although macro-scopic properties are determined by the micro or atomic structure of materials, it is still difficult to obtain such properties as hardness, intensity, surface tension, density, thermal expansion, thermal diffusion, viscosity and specific heat from a cell with just several atoms because of multi-scale effects. For solids, particularly for crystals, the situation is improved because of the development of solid physics theory, in which the structure of the whole crystal can be periodically constructed by one or several fundamental unit cells, and each cell has only a few atoms. As a result, the analysis of micro zones using techniques such as XRD, TEM, and EBSD has become important and been widely used for analyzing materials properties. In addition, the first principle calculation, which involves no more than 100 atoms, serves as a powerful method to simulate the solid properties. "However, for liquid metals, there are no long-range ordered structures, thus making this problem more difficult," report Wang Haipeng, Yang Shangjing and Wei Bingbo, scientists based at the Key Laboratory of Space Applied Physics and Chemistry, Department of Applied Physics, at Northwestern Polytechnical University, in the northwestern China city of Xi'an. "The objective of this paper is to explore the relationship between atomic structure and thermal expansion, to study if the thermal expansion coefficient can be predicted in atomic scale and to find how many atoms are sufficient to perform this prediction," they explain in a new study, "Predicting macroscopic thermal expansion of metastable liquid metals with only one thousand atoms," published in the journal Science China Physics, Mechanics & Astronomy. "Three pure metals Ni, Cu, Fe and one ternary Ni60Fe20Cu20 alloy are selected as models to investigate this scientific puzzle, because the temperature dependence of their respective densities has been shown to be valid from some reported studies." Their new research indicates that the thermal expansion of several types of metastable liquid metals can be predicted with just one thousand atoms, which reveals the connection between the microscopic information and the macroscopic property of materials. Thermal expansion is one of the most important properties for materials selection. Studying the thermal expansion of macroscopic materials from microscopic atomic scale has attracted increased attention by researchers. The elementary unit of most solid materials with crystal structures is the crystal lattice. Therefore, the thermal expansion behavior of macroscopic materials can be reflected by the change of one crystal lattice. These scientists explored the puzzle of whether the properties of liquid metals, especially undercooled liquids, could be predicted from the atomic scale. They also set out to determine the minimum number of atoms to be examined to make this type of prediction. 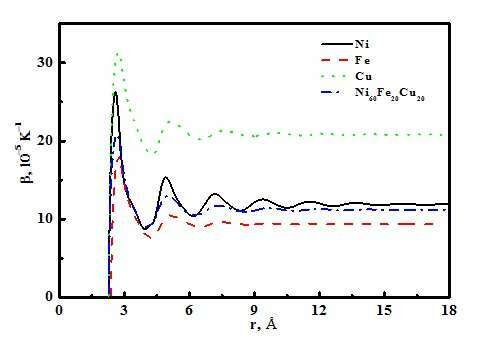 In one highlight of their research, the thermal expansion coefficients of liquid Ni, Cu, Fe and Ni60Fe20Cu20 alloy are studied via the cutoff atom number method and the cutoff radius method, as shown in Figure 1. The results indicate that the thermal expansion coefficient is a function of the atom cutoff radius, which tends to maintain a constant when the cutoff radius increases to 15 Å. In such a case, slightly more than 1000 atoms are revealed for liquid Ni, Cu, Fe and Ni60Fe20Cu20 alloy.